Vinegar is one of the most versatile tools you have in your pantry right now—if you're not using it at least a few times per week, you're under utilizing it! From homemade salad dressing to cleaning, vinegar's many uses make it a must-have in your home. Note: in general, vinegar that you would use around the home would be a plain, white vinegar. Make your drains sparkle. There's nothing worse than a clogged, stinky drain. Vinegar, along with baking soda, can clear up any residue and get that lingering odor out of your kitchen. Sprinkle 1/2 cup of baking soda in your drain and then pour 1 cup of vinegar (any type) over it. Run hot water down the drain after the fizzing stops. Clean your dishwasher. Dishwasher-cleaning packs are ridiculously expensive—skip them and use vinegar. Pour 1 cup of white or apple cider vinegar into your dishwasher and let it run a full cycle. Save calories on salad dressing. Bottled salad dressing is expensive and usually full of unnecessary salt or sugar. Go a more natural route with vinegar. 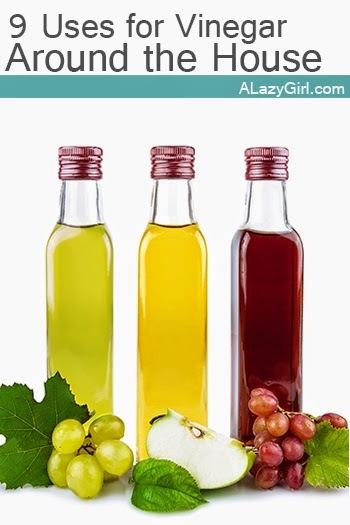 Mix 3 parts of olive oil to 1 part vinegar for a quick salad dressing. My recommendation would be a balsamic or apple cider vinegar for salad dressing. Get rid of mildew. Mildew is almost inevitable when it comes to your bathroom, thanks to the combination of heat and moisture. Spray white vinegar on any surface that has started to accumulate mildew and wipe off. Make your shower curtain sparkle. Your shower curtain can get filmy and kind of smelly if you don't keep it clean. Just spray white vinegar onto your shower curtain and wipe it off with a rag to cut through all the mildew. Do away with lime deposit corrosion. After lots of use, your showerhead can be affected by lime deposit corrosion. Vinegar makes it easy to clean overnight. Fill a plastic baggie with white vinegar, wrap it around your showerhead, and fasten it with a tight rubber band. Take it off in the morning and your shower head is ready to go! Make your closet smell fresh. Does your closet smell musty? Clear out the contents and wipe it out with a solution made from 1 cup of vinegar and 1 gallon of water. Let it air dry and you're done. Keep your carpets looking new. Erase the signs of spills, wear and tear, and foot traffic from your carpet. Mix 1 cup of vinegar in 1 gallon of water. Dip a push broom in the solution and scrub your carpets. Clear out candle wax. Let a candle burn a little too long in your room? Soak a cloth in an mixture of equal parts water and vinegar. Warm the wax up with a blow dryer and just wipe it off with the cloth. What are "non-food" uses for vinegar that your family uses? Share them below.